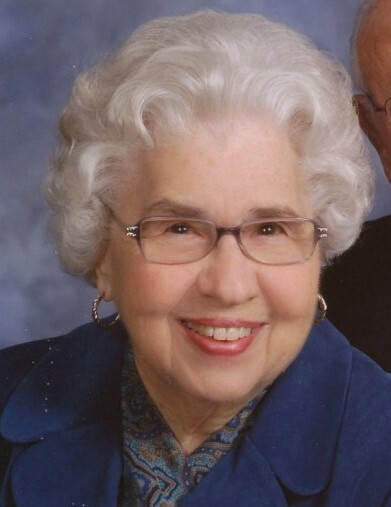 Peggy Guthrie, 92, passed away on January 23, 2019. She was born August 1, 1926 in Akron to the late Rev. Dr. Joseph and Gleena Hennessey. Peggy was a 1944 graduate of South High School and attended Akron U. She was very active in her community as a Cub Scout den mother, Sunday school teacher, PTA Health Chairman (providing eye exams for Green school children), and a 28-year volunteer for Green Good Neighbors. She enjoyed playing cards with a neighborhood card group and flower gardening. Peggy attended the Maranatha Bible Church and was a member of the Salt Sunday school class. Peggy loved and enjoyed her family. In addition to her parents, Peggy was preceded in death by her brother, Joseph (Dorothy) Hennessey Jr. She is survived by her loving husband of 69 years, Harold; sons and daughters-in-law, Robert (Rita), Donald (Cathy) Harold Jr. (Janet) Guthrie; 9 grandchildren; 17 great-grandchildren; special daughter-in-law, Marcia Eastman; brother, Albert (Mary) Hennessey of Hixson, TN; sister-in-law, Janice Cariens of Kilmarnock, VA; aunt, Charlotte Hennessy; as well as many nieces and nephews. Funeral service will be held at 11 A.M. on Saturday, January 26, 2019 at Schermesser Funeral Home, 600 E. Turkeyfoot Lake Rd. (SR619), Akron, Ohio 44319 with Pastor Don Rohrbacher officiating. Family and friends may call on Saturday from 10 A.M. until the time of the service at the funeral home. Interment will take place at Clinton Cemetery. In lieu of flowers donations may be made in Peggy’s name to Green Good Neighbors, PO Box 155, Green, Ohio 44232. To leave a special message online for the family, visit our website at www.schermesserfh.com.